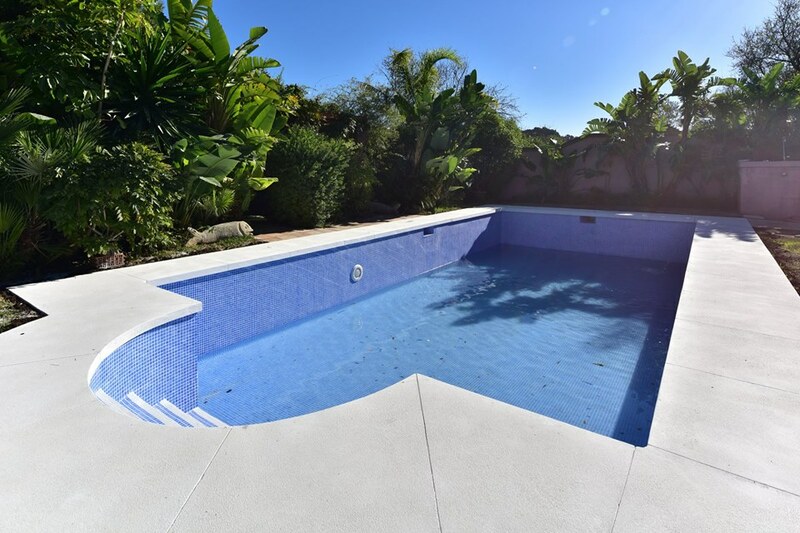 The marmolina white pool surround is a very hard wearing, non slip material. 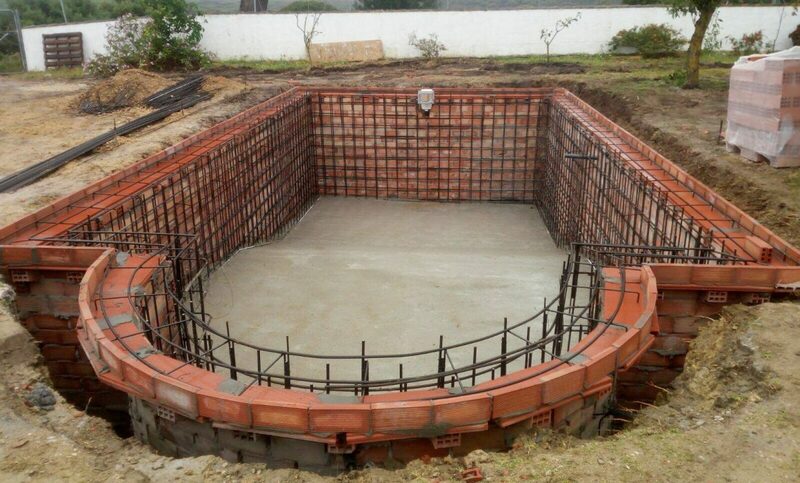 It is mixed onsite, poured into shuttering, then polished and afterwards we make cuts into it for expansion. 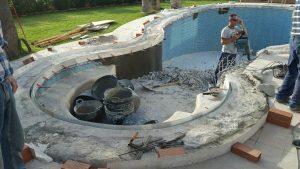 The surround on this swimming pool was in very poor condition, so had to be changed. 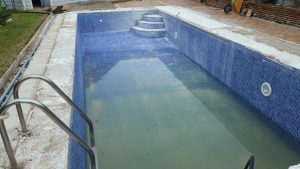 At the end, the pool will be acid cleaned and then regrouted. 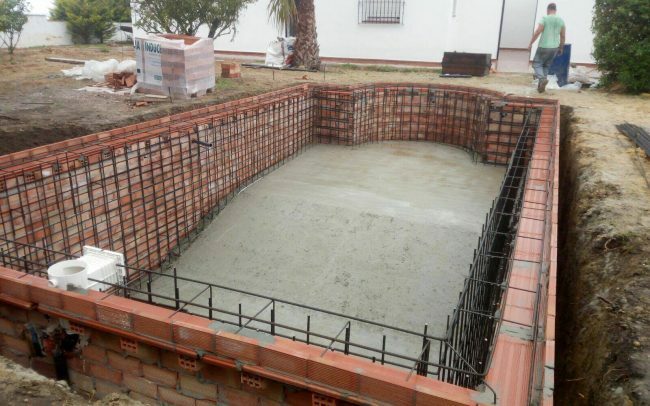 This work is part of a complete villa renovation in the popular area of Elviria, near Marbella. 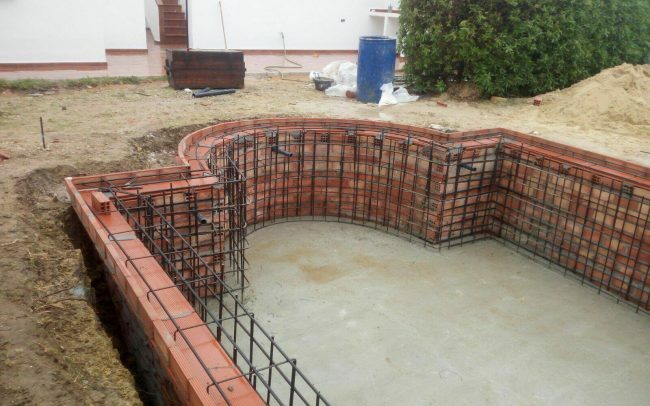 This kind of project normally takes around 5 days. 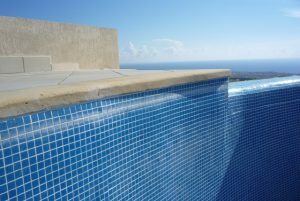 We are a construction based business, so it’s not often that we find a product that is worth recommending. 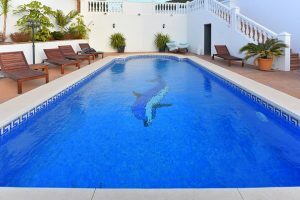 Staining around the waterline of a swimming pool is a common problem. 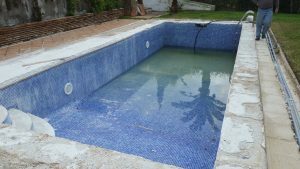 It is not always the fault of the maintenance of the pool, although this does play a big role in staining at the water line. 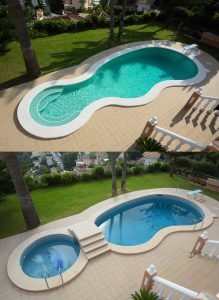 Things like heavy metals, sun cream, high pH will all cause a problem with staining of the pool border. 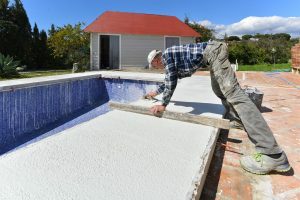 On traditionally built swimming pools, such as those with mosaic tiles, this area can be cleaned with hydrochloric acid, which will remove stains (but it also removes the cement grout and can start to damage the glaze of the mosaic tiles), but on fibreglass pools, liner pools and even painted pools this kind of treatment is not possible. 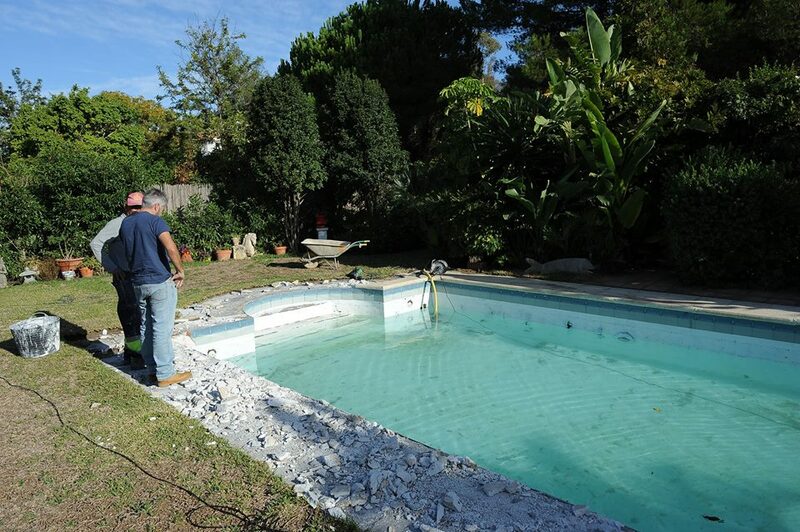 Usually the only solution is to resurface the pool. 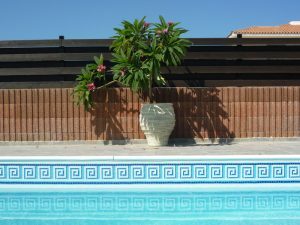 Our friends at piscinaliner.com have come up with the solution, a self adhesive swimming pool border that is DIY fitment, is safe with the chemicals and looks great. 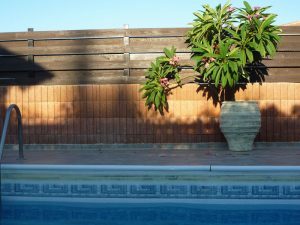 An unsightly border is a thing of the past. They ship throughout Spain. 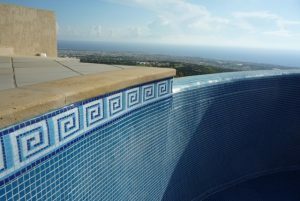 These borders can be used on any type of swimming pool, painted, fibreglass, polyester or liner. 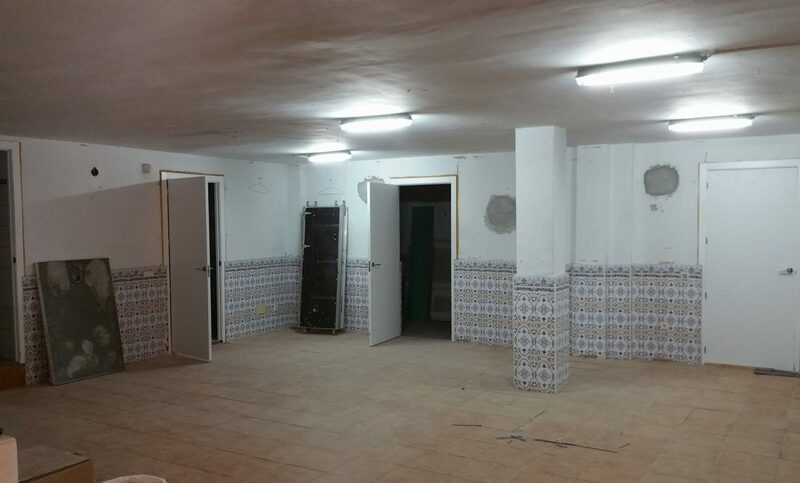 Here are a couple of before and after examples. 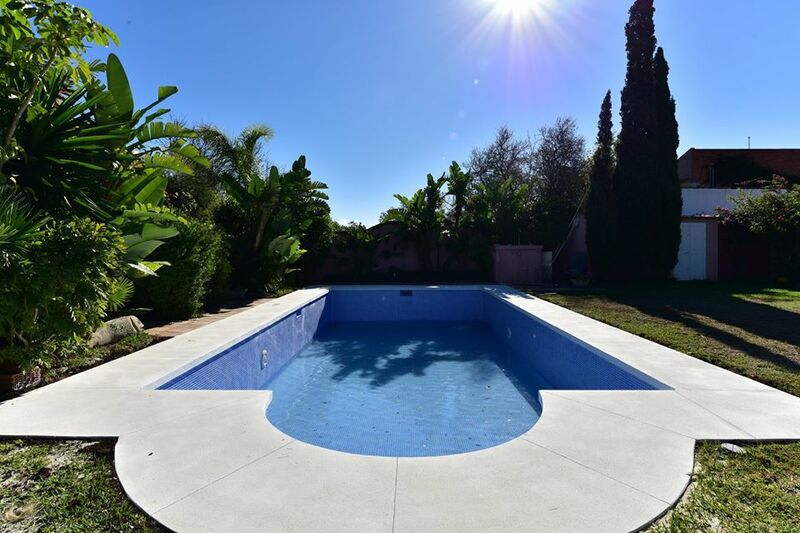 We completely renovated this old leaking swimming pool. The first thing we did was diagnose the source of the leaks. We diagnosed leaks in 2 runs of plumbing, in both the skimmer pipes and the return pipe. 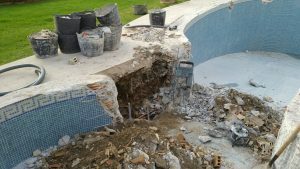 The bridge, which didn’t really have a purpose was removed so we could make the pool wider, as at this point it was very narrow. 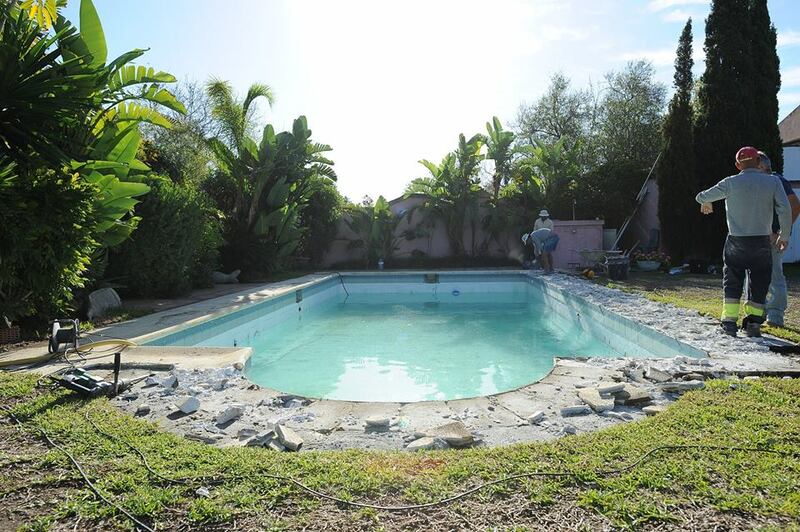 The pool looked even narrower once the bridge was removed. 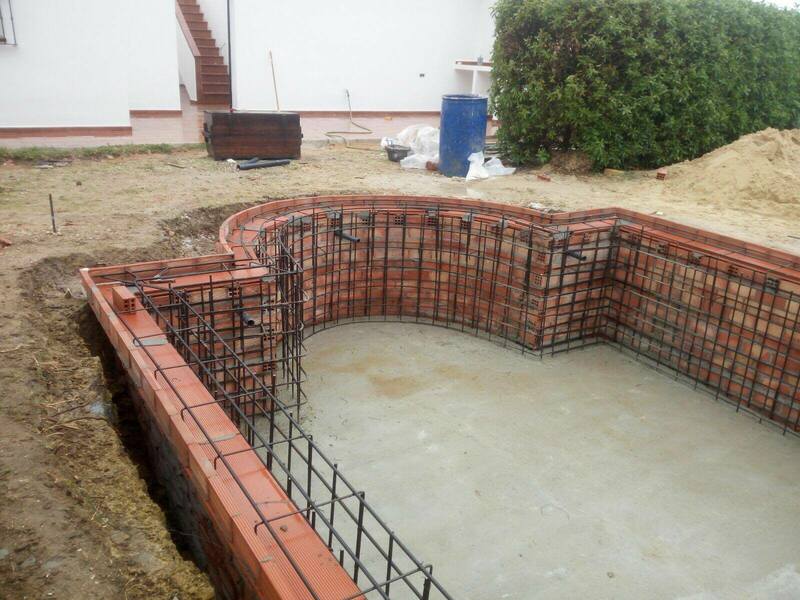 It is not normally recommended to alter the structure of a pool, but in this case it was feasible, as we were working on the shallow end of the pool, where there was less stresses involved. 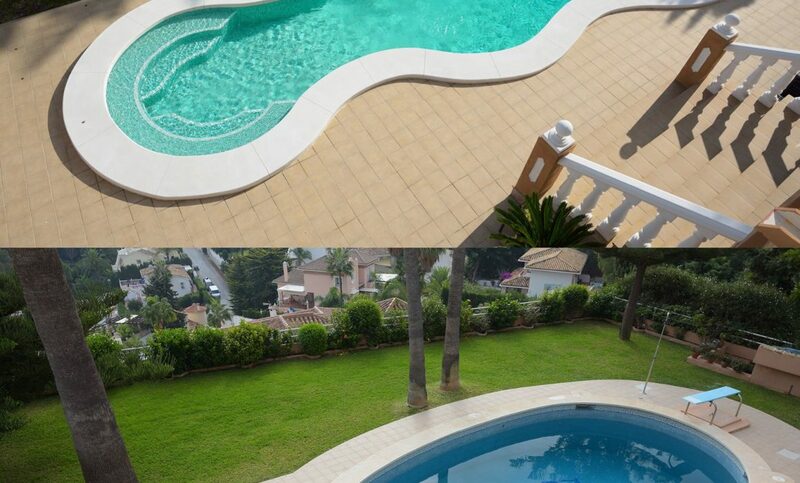 Steps were built into the shallow end of the pool that also serve as a seating area, perfect for enjoying the panoramic views from this villa in Mijas. 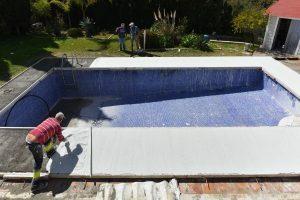 Once the pool had been made wider and the steps had been built in, we cast a new “marmolina” pool surround. 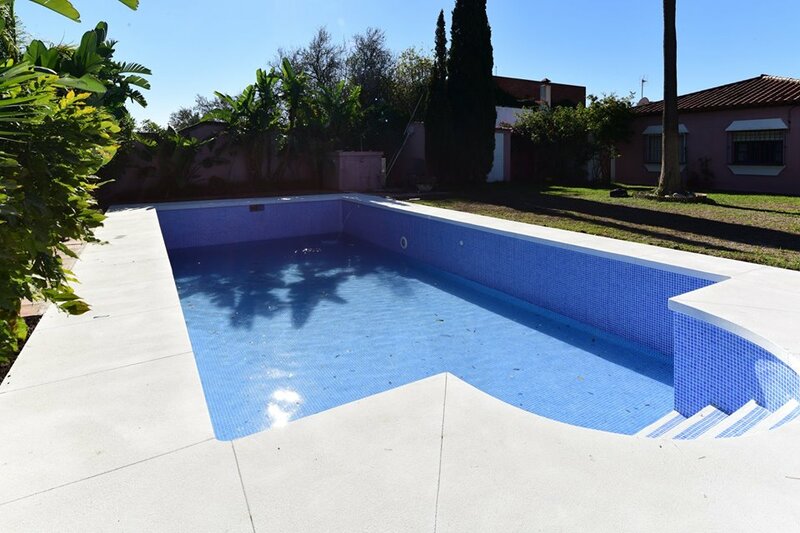 The marmolina is white concrete that is floated to give a uniform smooth surface, but still is non slip. 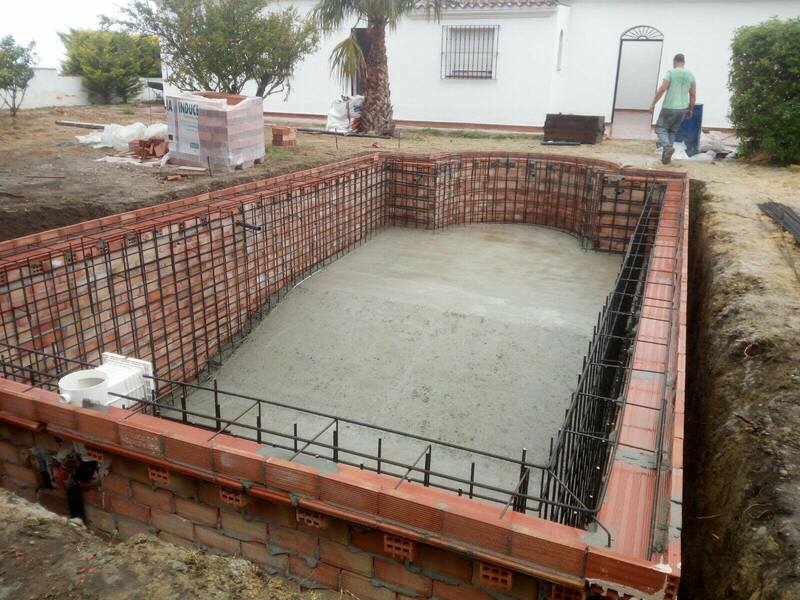 To make the marmolina we have to build shuttering around the pool and pour the mix into it. 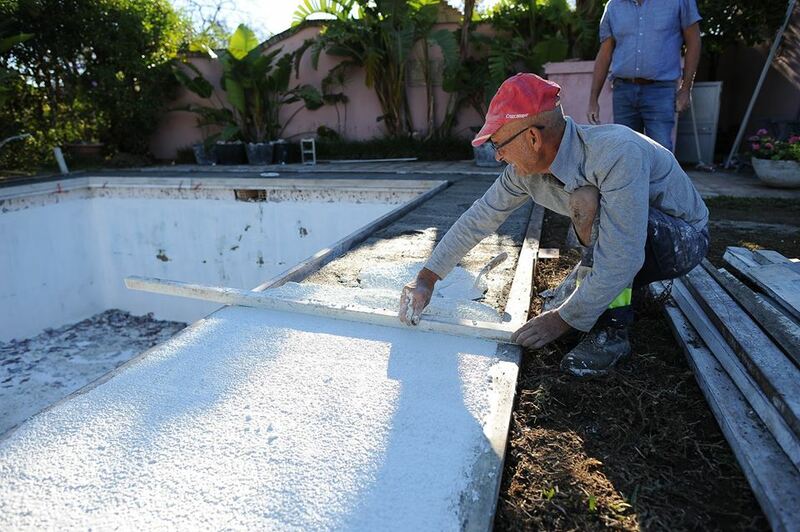 After the shuttering comes off, we polish the edges and put expansion cuts in it. 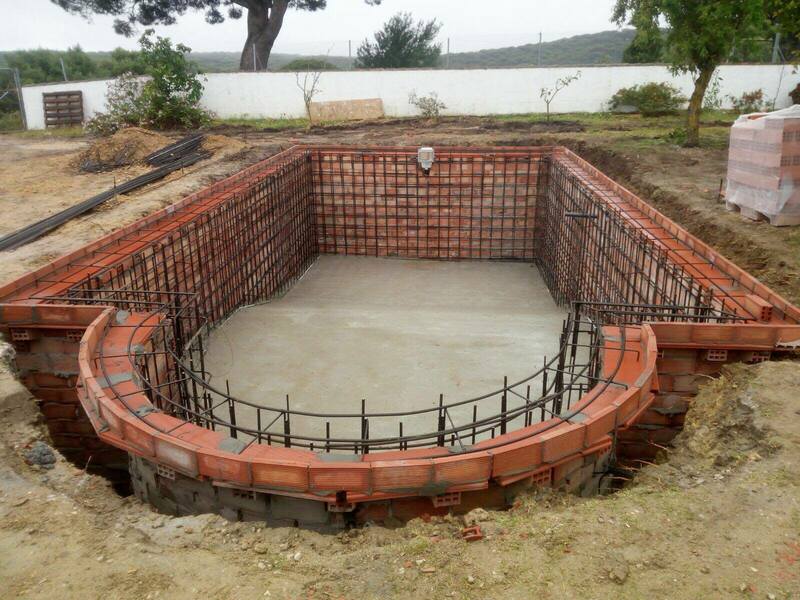 After this the swimming pool can be tiled, grouted and cleaned ready for filling. The plumbing is all new, for a trouble free future. 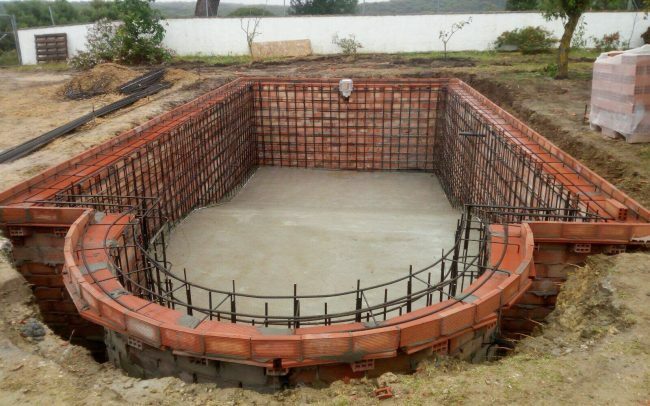 When planning works to the pool, it is important to consider the future.